Fishing just continues to stay strong. 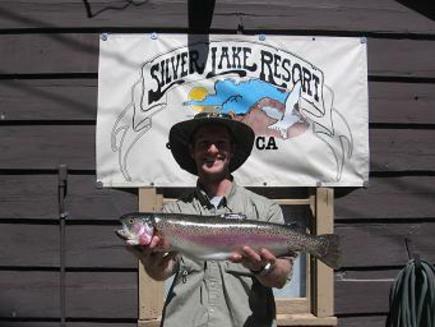 We have had a number of very impressive rainbows come out of Silver lake and Rush Creek this past week. 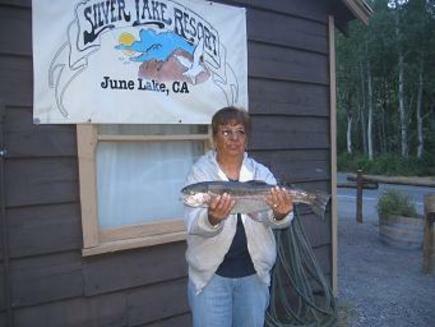 We recieved another load of Alpers trout and a load of DFG fish in both the creek and the lake, which has maintained a great level of fishing that is very good for this time of year. On the lake, using the standard power baits; Garlic, Rainbow and Salmon Egg Red, have brought in nothing but stringers full of stockable size trout, while going deeper and on the surface have brought home some whoppers this week. On Rush Creek, using any type of dry fly, like a #16 Grey Hackle Peacock a #16 Grey Mosquito or a #16 Yellow Humpy has produced very consistant fishing, while flipping a lure, like a Thomas Buoyant or a Panther Martin has also done well. It seems like the sky is the limit on what to use and where. 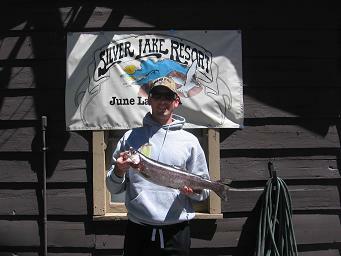 With all the Alpers and DFG fish going into the lake, fishing has been great. 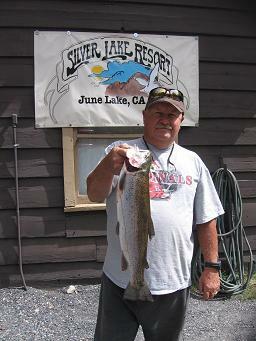 Gary Southern of Victorville caught a nice 3lb 10 oz Rainbow at teh outlet of Silver Lake using a brush hog. 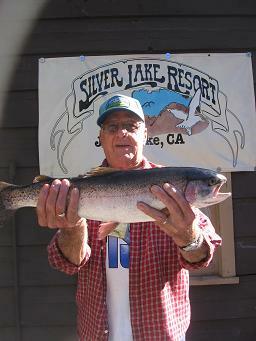 Mike Fortin of Whittier caught a great 5 lb rainbow from the shore of Silver Lake using a worm. 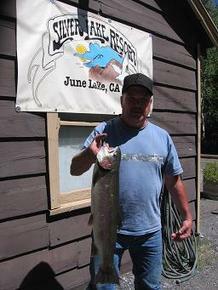 Preston Parrett of San Diego caught a 4lb 5 oz rainbow on teh outlet of Rush Creek using his fly rod and a mudler. 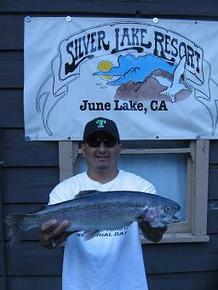 Mike Ledesma of tehachapi caught a 3lb 12 oz on Rush Creek using a Gold/Red Thomas Buoyant.